Antenna Magus version 2.2 released! Recent changes and performance improvements in Antenna Magus have had such a positive impact on the user experience that we decided to release Version 2.2 sooner than planned. In addition to the new FEKO and CST Studio Suite® antenna models that have been added to the database, improved memory management and performance really make Version 2.2 an exciting update. As promised the newsletters' focus is on new antennas so for more information on new features and bug fixes, please have a look at the release notes page on www.antennamagus.com/release-notes.php. There are 6 new antenna additions to the database since the release of Antenna Magus Version 2.1 - which brings of the number of antennas available in Antenna Magus to 125. At first glance, the 4-arm spiral is only a 2-arm self complimentary with 4 arms - but if you look closely it is a lot more than that. The addition of 2 extra arms improves the axial ratio, but it also introduces some extra capabilities. The 4-arm spiral can operate very much like the 2-arm spiral (often referred to as sum mode, or mode 1 operation), but a difference mode (mode-2) is also possible. 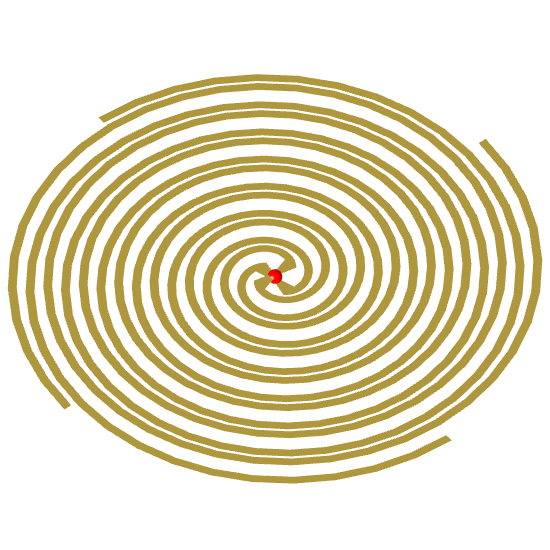 By using the correct feed network and signal processing, each arm of the 4-arm spiral can be fed 90 degrees out of phase, allowing mode-1 operation which produces a radiation pattern with a maximum in boresight. When feeding each arm 180 degrees out of phase mode-2 operation produces a boresight null. 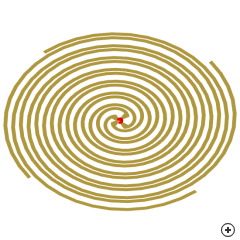 The 3D radiation patterns produced by these two operating modes as shown in the image below. Typical mode-1 and mode-2 RHC gain patterns across the operation band. 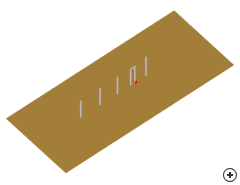 A beam forming network is often used to combine these two modes of operation vectorially, to form Σ + Δ, Σ - Δ, Σ + jΔ, Σ - jΔ corresponding to four squinted beams. 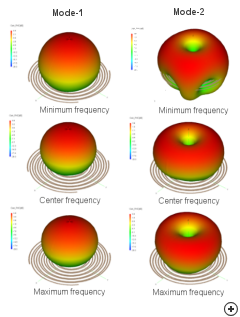 This method is popular in tracking radar applications where the antenna can be steered in the right direction when the target is moving away from the center null into one of the 4 quadrants. Image of the Scrimp horn antenna. 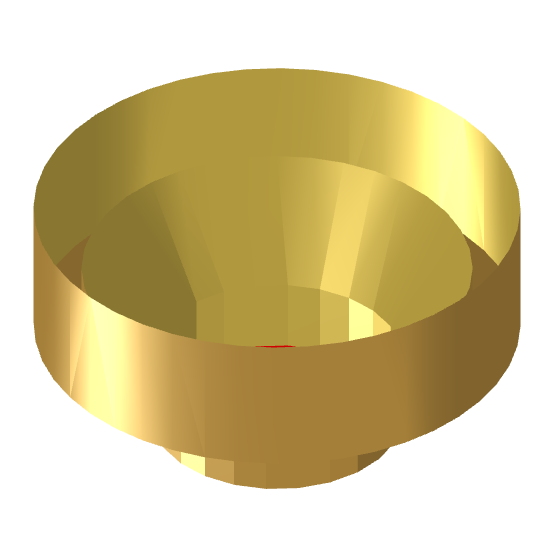 The Short Circular Ring-loaded Horn with Minimized Cross Polarisation horn or Scrimp horn is a very compact multimode horn with high aperture efficiency, low cross-polarisation and low VSWR over a broad frequency band. This antenna was specifically developed for applications with stringent requirements on electrical properties and light weight, low volume restrictions. Patch radiators and other planar antennas seem to be optimum candidates to meet the mechanical requirements, but in most cases they do not stand up to the Scrimp horn when considering electrical performance requirements. 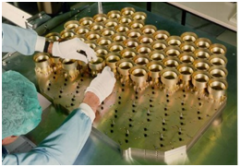 These horns are also used as radiating elements in high-density satellite multi-element feed-array applications as shown in the image of the INTELSAT VIII C-Band feed array below. Front and side view sketches of the Scrimp horn. Example of the Scrimp horn used in the INTELSAT VIII C-Band feed array. 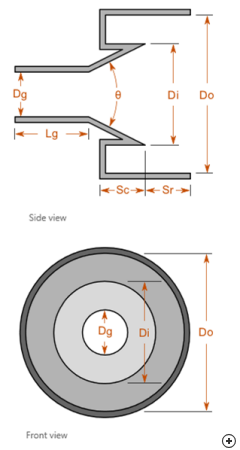 The Scrimp horn radiates a linearly or circularly polarised, single broadside beam, with medium gain and its impedance characteristics are dependent on the physical feed implemented in the antenna. The image below shows typical normalized E and H plane patterns for a design with maximum gain of 12.9 dBi. 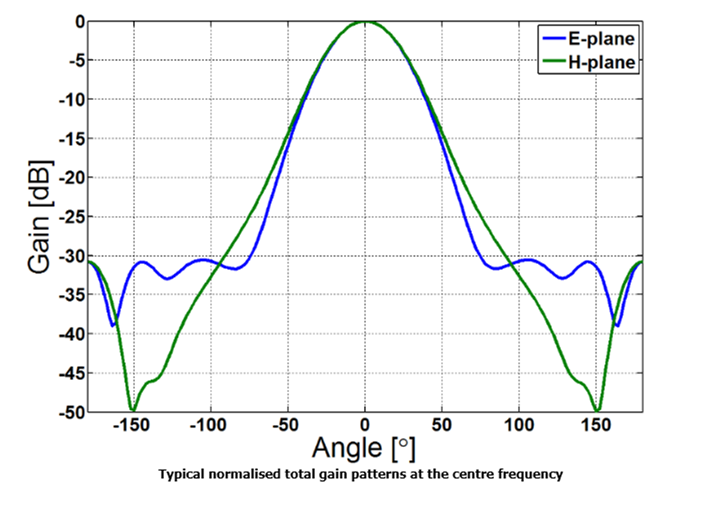 Typical gain patterns at the center frequency. Image of the Sleeve monopole antenna. 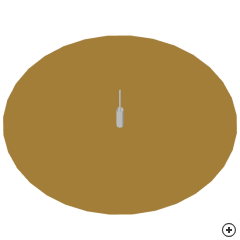 The standard monopole is one of the most commonly used antennas. In its simplest form, it consists of a quarter-wavelength wire driven with respect to a large ground plane by a coaxial feed line. 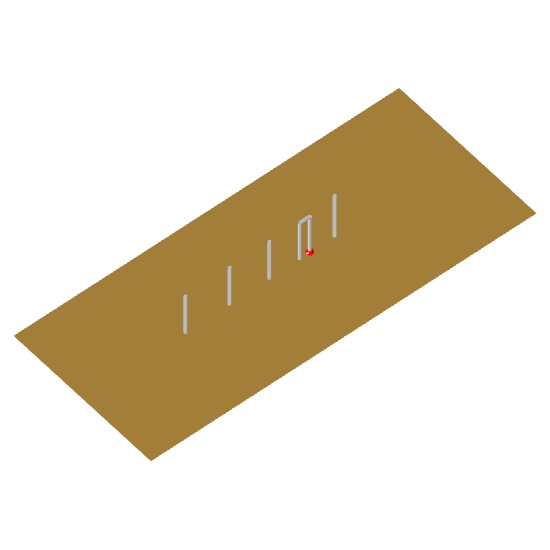 This simple topology has the drawback of being fairly frequency-sensitive - something that can be curbed through the addition of a sleeve. Although adding the sleeve increases manufacturing complexity, the cylindrical shape is maintained, instead of changing to a conical or more three dimensional (larger volume) structure typical of most other wide bandwidth monopole variations. This might be useful when wind loading need to be considered. 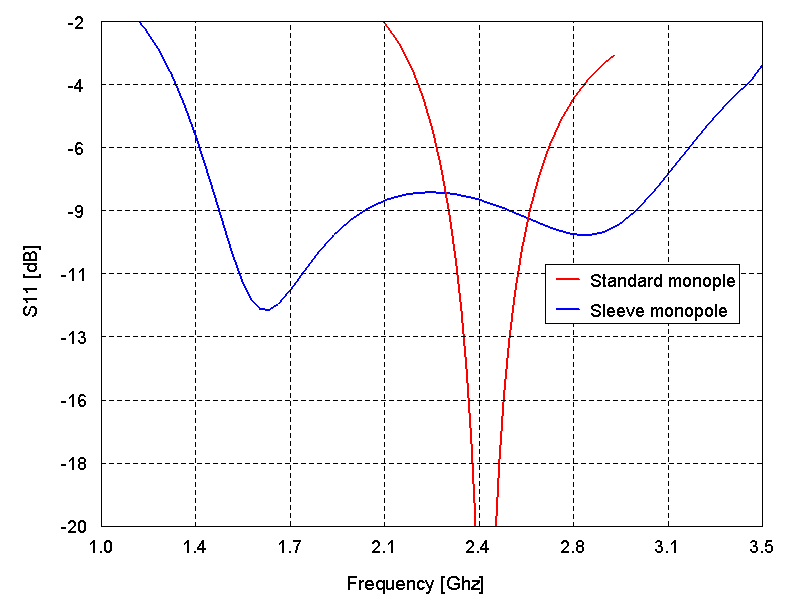 Another advantage of the Sleeve monopole is it's in-band pattern stability. 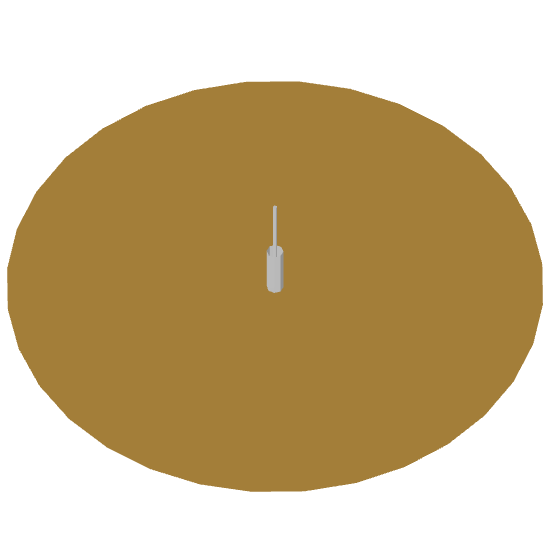 The image below shows an S11 comparison between the standard- and sleeve monopole antenna. 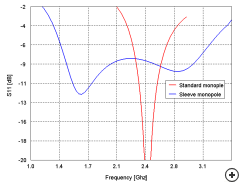 From this graph it is clear that a standard monopole is better matched over a narrow band where the Sleeve monopole is less efficient, but operates over much wider frequency band. S11 comparison between the standard- and sleeve monopole antennas. Image of the Yagi-Uda Monopole Array with Folded-Feed. The standard Yagi-Uda dipole array is probably one of the most popular antennas dating back to 1920 and is mostly used in HF, VHF and UHF frequency bands. These antennas typically have low input impedance and narrow bandwidth which can be improved by replacing the dipole feed with a folded dipole. The Yagi-Uda Monopole array with Folded-Feed replaces the dipoles with monopoles and uses a folded monopole instead of the folded dipole feed. This feed has half the impedance of the folded dipole version and does not require a balun. It can be used in applications where a ground plane is present and is consequently more rigid than dipole arrays. Antenna Magus allows the user to design the The Yagi-Uda Monopole array with Folded-Feed for different parameter objectives like gain, beamwidth and frequency and number of elements. There is a trade-off between the performance characteristics when optimising for increased bandwidth which reduces the obtainable gain. 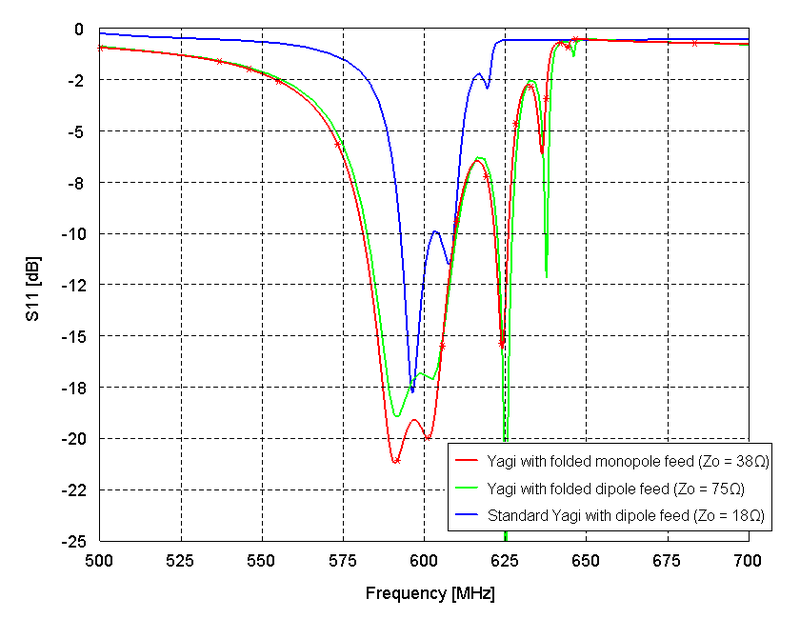 The following image shows a design comparison between the classic Yagi-Uda dipole array, Yagi-Uda Monopole Array with Folded-Feed and Yagi-Uda Dipole Array with Folded Dipole designed at a center frequency of 600 MHz, each plotted in its own reference impedance system. Note that the folded dipole version is ideally matched for twin flex or coax feed with Zo = 75 Ω where the other two antennas are matched at lower reference impedances. 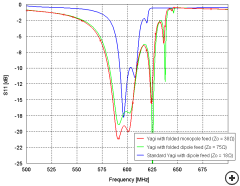 Design comparison between the classic Yagi-Uda dipole array, Yagi-Uda Monopole Array with Folded-Feed and Yagi-Uda Dipole Array with Folded Dipole designed at a center frequency of 600 MHz, each plotted in its own reference impedance system. Image of the Wire biconical antenna. The wire bicone is essentially an approximation to a solid biconical antenna, where the cone is replaced by radial wire conductors. This antenna is effectively a dipole modification which can provide wide-band operation without greatly increasing complexity. The wide angle biconical antenna is popular for its wide impedance bandwidth, omnidirectional radiation coverage and simplicity of mechanical design and installation. 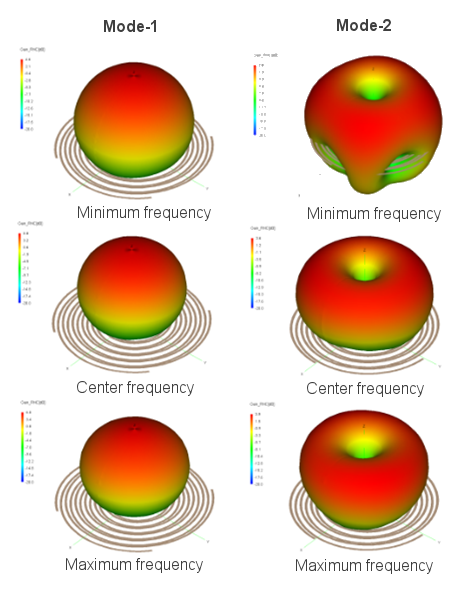 The plots below show the performance of a 75 Ω, Fmin = 1 GHz design with 17 radials. The omnidirectional gain pattern as seen in the center graph remains almost constant across the operation band. 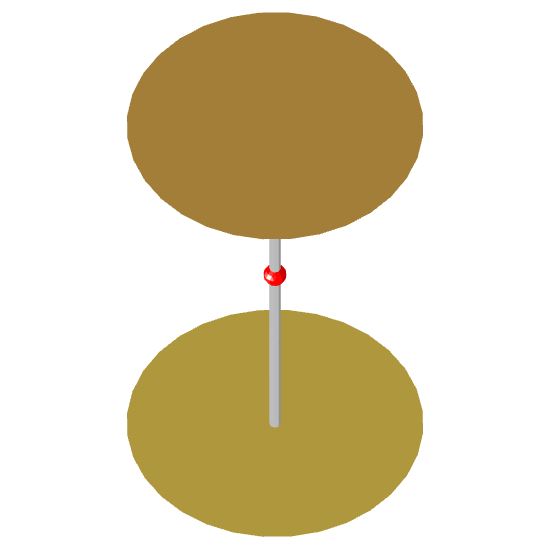 Performance of a 75 Ω, Fmin = 1 GHz design with 17 radials. 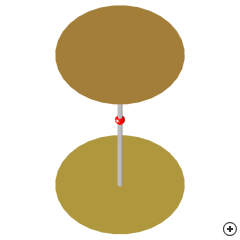 The end-loaded dipole is an electrically short antenna having a total length < λ/4. 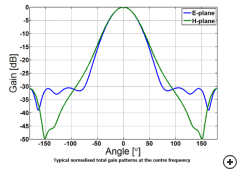 It's performance is comparable with a normal dipole having an increased impedance bandwidth. Although electrically small antennas usually have high Q's and therefore narrow impedance bandwidths (1/Q) end or top-loading lowers the Q and thus increases the bandwidth. End-loaded dipole antennas are popular for long range communication in LF, VLF and VHF bands. 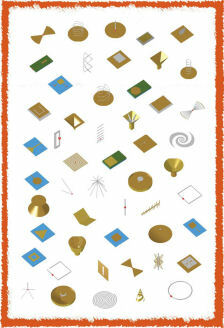 I wonder when last antenna design reached international headline news...? The recent Apple iPhone 4 saga that generated news headlines like, "iPhone 4 Loses Reception When You Hold It By The Antenna Band" really caught my attention - simply google "antenna design flaw" and you would think that this is the only antenna design faux-pas that has ever been made! It seems that the positioning of the antenna/s means that holding the phone at the bottom with thumb and index finger touching both sides of the phone, affects the antenna performance such that the phone loses reception. I can't help feeling quite sorry for the antenna designers - who probably had to "please explain"! One positive is that stories like this really emphasize what an integral part antenna design plays in the success of a product. Hopefully Antenna Magus will save other antenna designers time, allowing them to focus on issues like these and avoid similar embarrassments in future... I can't decide if it is satisfying or disappointing to think that we will probably never know about the errors that Antenna Magus has helped prevent!